A long-term, interdisciplinary research collaboration at the University of Maryland's A. James Clark School of Engineering has made significant progress in detecting and treating bacterial biofilms by developing new chemical compounds, materials, and microsystems that can fight these sources of post-operative infections. In their 10-year collaboration, Professor Reza Ghodssi (Department of Electrical and Computer Engineering; Institute for Systems Research), Professor William Bentley (Fischell Department of Bioengineering; Robert E. Fischell Institute for Biomedical Devices), and their students and colleagues have advanced the state of the art in both biofilm detection and treatment. They have developed microsystems that can detect and measure biofilm as well as microsystems for biofilm treatment. The most recent device, which can be placed in urinary catheters, can do all three. Doctors need far better ways to detect, measure, and effectively treat bacterial biofilms, which are almost always involved in device-associated and post-operative infections and account for approximately half of all the estimated 700,000 to 2 million hospital infections annually. They form when planktonic bacteria adhere to moist surfaces, then secrete proteins and carbohydrate polymers that form an encasing "extracellular matrix." This matrix makes it easier for them to adhere to the surface, to communicate and to spread through gene transfer. It also offers significant protection for the bacteria against antimicrobial medicines. "Our work develops future technologies such as flexible substrates and devices that we hope soon will be able to combat the formation of bacterial biofilms and treat their associated infections in patients," Ghodssi says. The researchers developed a variety of treatments that can reduce or eliminate the need for antibiotics. They worked with colleagues from materials science and engineering, bioengineering and chemical and biomolecular engineering to develop chemical compounds called quorum sensing inhibitors which can prevent biofilm formation by interrupting the pathways by which bacteria communicate. "The idea is to shut off communicating cells and make them susceptible to various treatments," says Bentley. They also advanced surface coatings, such as liquid-infused surfaces, micro/nano structured surfaces, and antimicrobial-infused surfaces, that make it harder for biofilms to attach to medical devices. In addition, they developed electroceuticals that use electric fields to generate biofilm-killing toxic compounds. In an action called the bioelectric effect, a small electric field increases the efficacy of an antimicrobial medicine, such as an antibiotic or quorum sensing inhibitor. Adding the electric field to treatment lowers the amount of antimicrobial needed to be effective, helping slow the increase in antibiotic-resistant bacteria. In conjunction with the advances in treatment, the researchers also developed ways to measure the presence and growth of biofilms, including optical sensing systems that measure changes in opacity that accompany biofilm formation, surface acoustic wave sensors that quantify the mass of a biofilm as it forms and alters a surface's resonant frequency, and microelectrodes that measure biofilm growth through electrochemical analysis. The researchers have built microsystems that bring all these advances together to both measure and treat biofilm. Over the years they have refined and incorporated these systems into small, biocompatible, and flexible devices. The new flexible impedance sensor brings several of these advances together in one device. It is a biofilm sensing and treatment microsystem for urinary catheters that combines biofilm sensing and the bioelectric effect treatment in a flexible cylindrical tube. The device is rolled and inserted inside the catheter, where its microfabricated polymeric substrate and electrodes seamlessly conform to the catheter's surface. The concept also has the potential to work on other kinds of biofilm-susceptible surfaces, such as implanted medical devices. 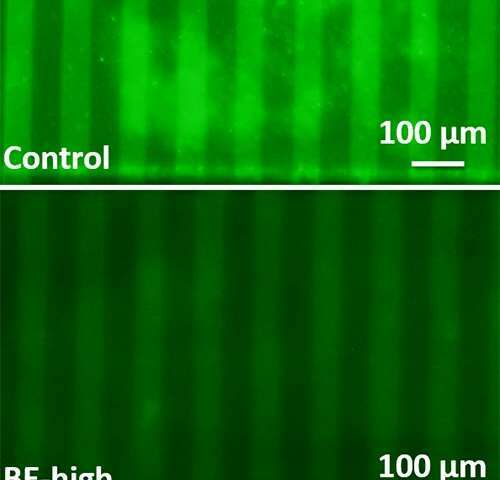 "In addition to detecting the formation of the biofilm by optical, acoustic, and impedance techniques, this research group has demonstrated that applying electric fields renders the biofilm much more susceptible to antibiotics," writes Roger Howe, the William E. Ayer Professor of Engineering in the Department of Electrical Engineering at Stanford University. "The impact of this research, as it transitions into biomedical devices, will be to reduce infections while simultaneously reducing the dosage of antibiotics—a major contribution to improving healthcare." "Drs. Ghodssi, Bentley, and colleagues at the University of Maryland have developed several model systems that can provide sensitive, real-time detection of microbial biofilms, suggesting the potential for new approaches for biofilm surveillance on indwelling medical devices," says Rodney Donlan, a biofilm microbiologist at the Centers for Disease Control and Prevention in Atlanta. "We are so excited that these efforts will be among the first devices developed by our new Robert E. Fischell Institute for Biomedical Devices," says Bentley. "It will bring together these kinds of multidisciplinary approaches and talented individuals to build systems that make a difference."